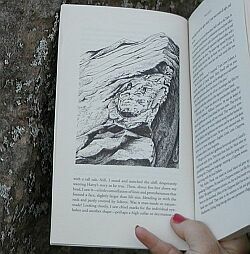 Teachers and educators will have the unique opportunity to meet with Loren Graham, the author of A Face in the Rock, a novel about the Grand Island Chippewa in the nineteenth century, at a workshop scheduled for September 19-20 on Grand Island near Munising, Michigan. Graham will share his reflections on the writing of the novel that tells the story of change, adaptation, and the loss of a culture, as well as, lead participants on a rare tour of the Old North Lighthouse, his summer home for the past forty years. On Friday, participants will learn about Native American History from Delores LeVeque (great-granddaughter of the book’s main character, Powers of the Air), take an interpretive bus tour of Grand Island visiting ten historic sites, visit to an archaeological research site on the island with Janel Crooks of the Hiawatha National Forest, and participate in hands-on activities measuring forest and beach succession. 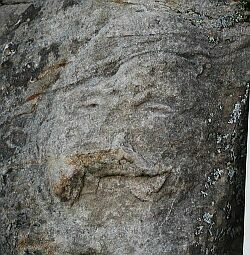 On Saturday, participants will visit with Loren Graham at Old North Lighthouse, visit some historical sites, and learn about several interdisciplinary elementary and secondary teaching units based on A Face in the Rock. The workshop will address Michigan Content Standards for Science, Social Studies, and Language Arts. The workshop will take place on Grand Island from 9:30 am to 4 pm on both Friday and Saturday, September 19-20. Participants will meet at the U.S. Forest Service ferry dock for Grand Island to board the ferry to the island. The ferry will depart at 10 AM both days. Participants will have the choice to return by ferry at 4 PM or 6:00 PM each day. The workshop will take place entirely outdoors. Participants are welcome to bring their bikes or rent bikes in order to tour the island after the workshop. Participants may camp on the island or stay at area motels on Friday night. Information on local accommodations can be provided upon request. Participants may choose to attend one or both days. Participants may register to earn one credit from Northern Michigan University (ED 989; $189 per credit) or Michigan Technological University ED 5680; $198 per credit), if attending both days. Cost of university credit is the responsibility of participants. Participants may request course credit registration information when they register for the workshop. The cost of the workshop is $55 for one day, or $80 for both days (includes ferry both days, bus tour both days, handouts, plus Friday and Saturday lunches). The workshop is limited to 25 participants. Make checks payable to the Copper Country ISD. Registration deadline is Friday, September 12. Send registration form and payment to: Loret Roberts, Western U.P. Center for Science, Mathematics and Environmental Education, P.O. Box 270, Hancock, MI 49930 or fax to 906-482-5031 or email loret@ccisd.k12.mi.us . Participants in the CCISD Eisenhower Consortium can have their registration fee reimbursed after their attendance has been confirmed at the workshop. For more information, contact Joan Chadde at jchadde@mtu.edu or (906) 487-3341. 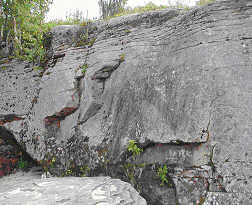 A Face in the Rock, written by Loren Graham and published in 1998, describes the legend of Powers of the Air and the band of Chippewa living on Grand Island in the nineteenth century. Grand Island lies off the south shore of Lake Superior, near Munising. It was once home to a sizable community of Chippewa Indians who lived in harmony with the land. Their tragic demise began in the nineteenth century when fellow tribesmen from the mainland goaded them into waging war against rival Sioux. The war party was decimated; only one young brave, Powers of the Air, lived to tell the story that celebrated the heroism of his band and forms the basis for the legend that survives today. Powers of the Air lived to witness the desecration of Grand Island by the fur and logging industries, the Christianization of the tribe, and the near total loss of the Chippewa language, history and culture. The story ends with the protection of Grand Island within the National Forest system, and the resurgence of Chippewa culture. Author Loren Graham is a historian of science who holds a joint appointment with the History of Science Department at Harvard University and the Science, Technology and Society Program at Massachusetts Institute of Technology. He spent more than forty years researching and reconstructing the poignant tale of Powers of the Air and the Grand Island Chippewa. Joan Chadde at jchadde@mtu.edu or 906-487-3340 or stop by 105 Dillman Hall on the Michigan Tech campus in Houghton. If you have any problems or comments, contact the webmaster.